One of the things our customers particularly like about your desk-mounted privacy panels is that they installation isn’t a permanent commitment. We considered the various ways to attach a panel to the desktop and decided to go for the low impact approach. Unlike products that force you to put a hole in the desk and screw the panel in place, ours fit on your desk with a removable bracket. 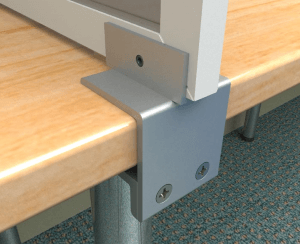 There’s no bolt going through your desk and no top plate screwed down into the surface. This means you can always decide to move the panel to a different position on the desk or switch it to a new desk at any time. We take it for granted that your workplace and office furniture won’t stay the same forever – but we do think that you shouldn’t have to put a hole in your desk to Support an improved work style!